Paying off student loans – it’s not something anyone looks forward in their life after college, but it’s practically a necessity due to increasing tuition prices and fees. Depending on what school you attended, you could be facing a few thousand dollars or tens of thousands of dollars. For some, the debt amount may seem extremely daunting and there may seem like there is no way out. Don’t fret! As a social services worker who doesn’t make a lot of money, I have student loans and understand your situation. 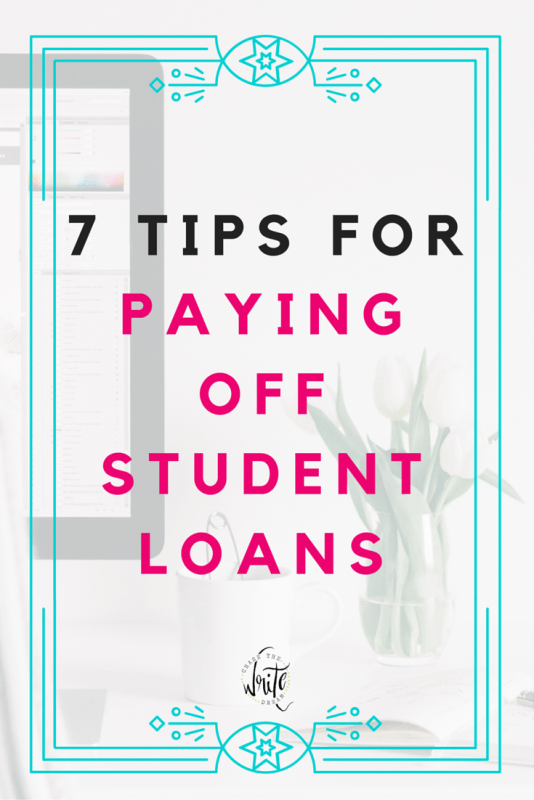 Although I can’t wave my magic wand and make your debt disappear, I can provide you with 7 tips for paying off student loans. P.S. I have a post that explains how I earned extra money so I could pay off my student loans quicker. Check it out here: How I Paid an Extra $3,000 on My Student Loans in One Year. Depending on the types of student loans you have, you may be accountable for paying interest that accumulates while you are in-school or in deferment. The loans you will want to look out for are the unsubsidized loans as these are the ones which you are responsible for any accrued interest at any time. Although no payment is going to be required while you are enrolled in school at least half time, you will still want to start paying off student loans early so that you won’t have to pay as much in the long run. Even if you can only contribute $10 each month to the bill, at least that’s $10 that won’t be accruing interest anymore! Think about it – if you are in school for four years and you put $10 toward a subsidized or unsubsidized student loan each month, then you already have $480 paid off by the time you graduate! Extra Tip: Ask your lender to apply your early payment to the loan that is accruing interest. If you don’t have any that fit this criteria, ask them to apply it to the loan with the highest interest rate or balance. Getting cash back from your online purchases is an easy step you can take to pay off student loans. Ebates is my personal favorite because they have a wide range of store options, AND they offer double cash back days! Upromise is another program that allows you to apply your earnings directly to an eligible student loan, or you can create a college savings account if you have a child you would like to start an account for. Finally, Swagbucks has expanded their services to allow members to earn cash back by shopping and eating locally! All you need to do is connect one of your credit or debit cards to your account. 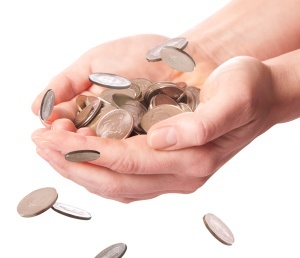 It may not seem like much at first, but every little bit counts when it comes to paying off your debt. Joe needs to come up with a plan for paying off student loans. Listed below is the amount of each loan, the interest rate, and the minimum payment necessary. You will notice that Joe is paying the minimum balance on loans 1 and 3 but he is paying $50 extra on loan 2. The reason behind this is that with the debt snowball method, you want to start with the lowest balance first and then work your way up. Joe has taken the $75 that he was using to pay loan 2 and is now using it to pay off loan 1 quicker. The whole process will continue until Joe has paid off that loan and is using his full $200 each month to put toward the largest loan, the third one. The debt snowball method is used until all balances are paid completely. This is an aggressive approach to paying off student loans – You will have to get really good at budgeting and cutting back in some areas, but I promise that this method works and is worth the initial sacrifice! The key to taking advantage of these programs is to take part in repayment plans that are based on your income. If you stick with a standard repayment plan, your loan should be paid off in full after ten years, so that would be defeating the purpose. Also, graduated repayment plans aren’t accepted with loan forgiveness programs. More information about loan forgiveness programs can be found at the Federal Student Aid website. Look, student loan debt isn’t going to go anywhere, so you might as well get rid of it as fast as possible. Although no one wants to use their spending money on bills, it may be wise to take at least a portion of those extra funds and put them toward a high balance loan or one that has high interest. Do you want to be paying off student loans for the next ten or more years? I didn’t think so! You may have heard of default before. Trust me, it’s not something you want to have on your record. I’ve worked with students in the past who have been in default and they were unable to get additionally funding to go back to school. Also, their credit was typically affected, and not in a good way. Remember, this is the government’s money that you have borrowed and are now not paying back! Because of that fact, the government could withhold some of your tax return money or even take money from your paychecks if they want to. Don’t let yourself get to this point! If you know you are experiencing a financial hardship and you just can’t make the payments right now, call your lender and see what you can work out with them. It’s better to put a loan in forbearance for a short period of time than to have a tarnished credit report. Certain companies offer scholarships to help you with paying off student loans. There are also employers who will pay their employees to go to school. If the free money is there for you, go after it! Even if your employer is only able to pay for any education that you do in the future, it could still be well worth your time because advanced education typically means a higher paycheck in the end. As for scholarships, keep doing your research and make it a goal to seek out those that specifically are available to students who have debt from being in school. I highly recommend keeping a budget sheet to help you track all of your bills and expenses. 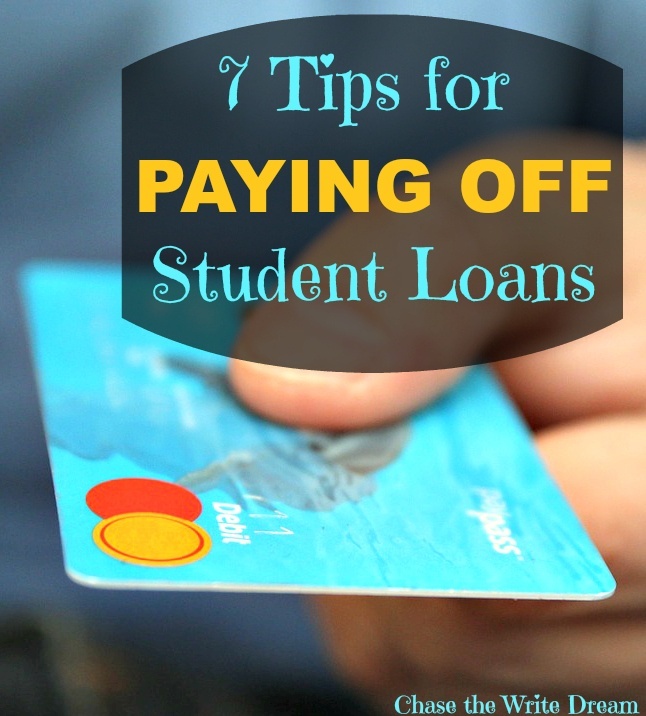 By doing so, you may find some extra money that you can use for paying off your student loans! I am SO thankful that my parents did that pre-paid education thing when I was in kindergarten! I am definitely blessed to not have student loans. But this blog post is spot on! It’s so true to start early! Great post – I know people that owe up to £30,000 (about $46,000) from going to Law school and they are struggling so bad! I am a big fan of the snowball method. I use it to pay off credit card debt and it always works out and is more satisfying for me because you can pay off more as time goes on. Fabulous tips! My husband and I are working on paying down ours while simultaneously cash flowing the rest of my tuition. Something that has truly motivated us has been dreaming of what we can do together when we are debt free! We’ve talked about working at Disneyland for a year and even teaching English in Japan too! It really gets you motivated. All the little efforts made now can definitely pay off in the long run! I am SO glad that my student loan is paid off, but now we have my boyfriend’s to worry about! Starting early is definitely key. AAhhh Im so not looking forward to paying for my loans after graduation day. I never had loans for my undergraduate, but so now for graduate is it something I dread. I love all the tips, Im going to start paying some of the interest early like you suggested. Definitely saving this post for future reference. THANKS! Glad it was helpful for you! I really do wish there were more grants and scholarships for graduate students. This is great advice. My husband and I just started paying back my student loan at the beginning of the year (about 19,000) and we first consolidated all my loans to reduce interest and then opted for the graduate payment plan. We are paying smaller amounts now for the first three years while my husband finishes school; then will be able to pay a little more after! I knew someone who defaulted on their student loans because they just didn’t want to pay them back. So stupid, their credit is basically ruined for life! This is a fantastic post!! It’s so important for people to understand how to really pay of their student loans instead of just ignoring them and acting like they will magically go away!! Thank you for stopping by, Kati! I agree… I think that people need to take a more proactive approach to handling student loans. Great tips! My husband and I recently graduated and are having to face the dreaded repayment process. Ah yes, never a fun time. I hope you guys can knock them out quickly! Thanks for these great tips! My parents initially said they would pay for all of my loans but when I got my big girl job and was making more than they thought I would, it suddenly became my burden. I love the snowball idea. I had recently started doing something similar, but was paying off highest interest first. I didn’t think to go for the lowest amount one. That’s a brilliant idea! Student loans are just the worst to pay off! I like tackling the small debt first because they it makes me feel like I’ve accomplished something once it’s gone! Totally agree one of the biggest mistakes I made with leaving on campus. The amount they can is crazy. I found out from a friend that I could easily find a decent off campus living arrangement through livably.com. I have saved so much just from making this one change. It has reduced my student loan drastically. nobody ever talks about paying off $80k in student loans early… that’s the article I want to see. These tips can apply to any loan amount. Yes, $80k is definitely going to take a lot longer to pay down, but any extra money you can put toward your loans could take years off its lifespan. Hang in there!